No illegal drugs have been found in the Beverly Hilton hotel room where Whitney Houston died Saturday afternoon, at least not yet, but prescription drugs were present. According to TMZ website, it’s possible the singer drowned in the bathtub. Sources told TMZ that when EMTs arrived Whitney Houston’s body was already removed from the bathtub so it will take an autopsy to determine if she OD’d, drowned or died from some other cause. Informed sources told the celebrities website that Beverly Hills cops, who were still searching the room at this time, found various pill bottles. There was no evidence that Whitney Houston was drinking alcohol in the room. 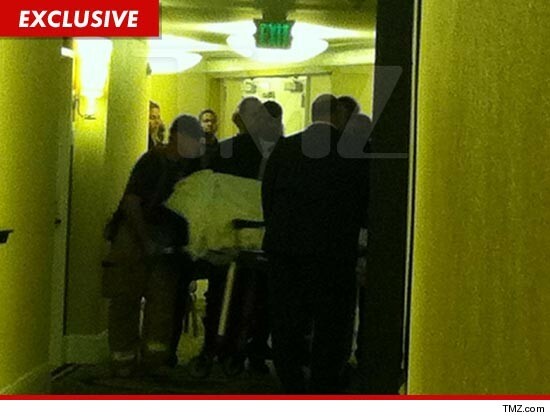 Whitney Houston’s body was just removed from the room on a gurney. It will go to the morgue for an autopsy to determine cause of death.